Stuck? Need a hint? 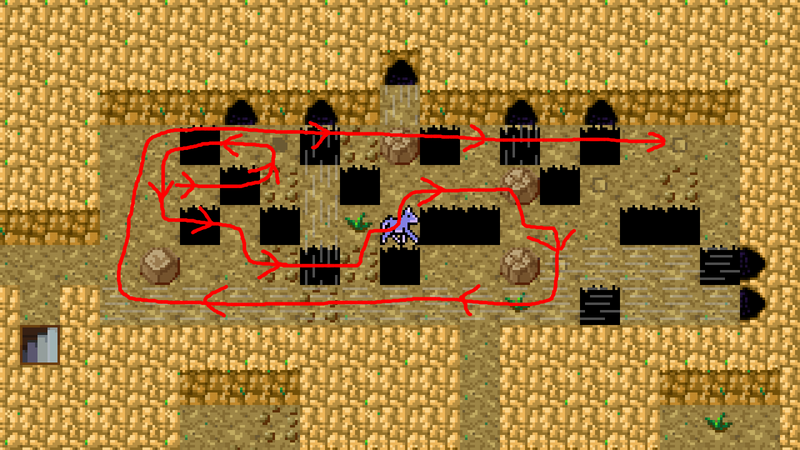 Use the following guide to better navigate the labyrinth. Birds are quick and hit hard, possessing a variety of physical and magical abilities. Pair with insects or bulls to minimize their fragile defense. Giants have high health and great strength but are slow and susceptible to many attack types. Pair with sea creatures for the ultimate hard-hitting powerhouse, just watch out for lightning based attacks. 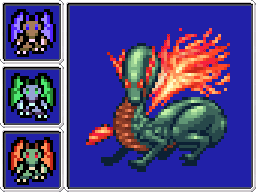 Canines are very well-rounded, specializing in multi-hit attacks. Because canines do not possess any inherent strengths or weaknesses they cross well with all other types without introducing any negative characteristics. Felines specialize in speed and possess abilities with very short cooldown times at the expense of physical and magical defense. Combine with insects for added durability. 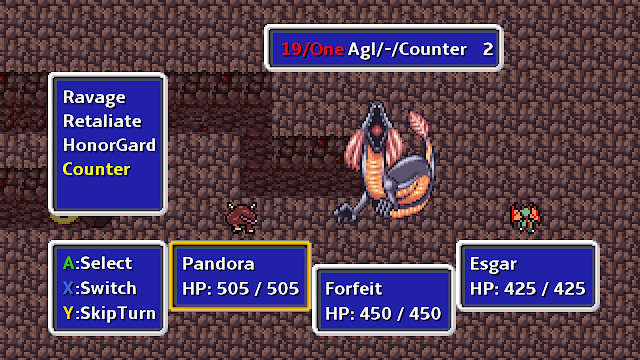 Snakes hit hard physically and use abilities that target the entire enemy party. 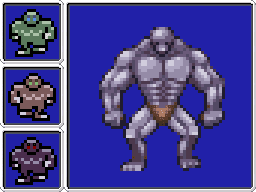 Cross with Giants to maximize damage output or with sprites to boost magical resistance. 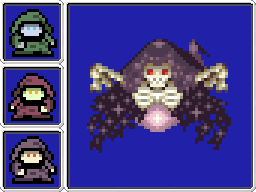 Undead specialize in abilities with a high chance of causing debilitating status effects. Match Undead with Demons to offset weaknesses and for some offensive magic. 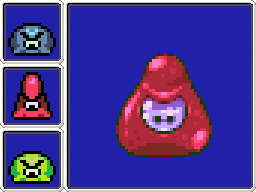 Slimes are highly resistant to all physical attacks but woefully unprepared for any magical onslaught. 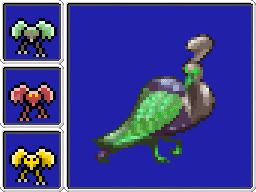 Combine with sprites for a fortified magic-user. 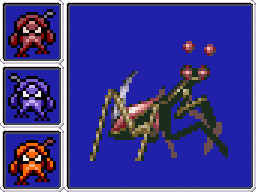 Kings of the counter-attack, insects possess many moves that inflict status effects, and their hard shells make for strong defense. Cross with spiders or felines to maximize damage of counter-attacks. Slightly slower but more robust than birds, dragons' repertoire often include magic attacks that inflict crippling status effects. Pair with undead for a well-rounded offensive unit. Bulls are extremely resilient at the cost of speed and specialize in moves that create a significant buff to defense while focusing all attacks on the bull. Pair with any character that needs a boost to defense. 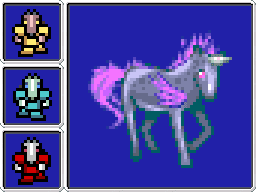 Equine are relatively quick and possess both physical and magical attack abilities as well as helpful support moves. 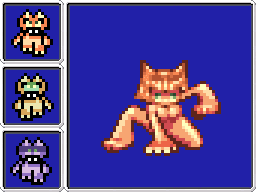 Pair with felines to minimize weaknesses and to gain initiative in battle. 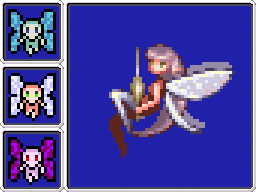 Sprites possess high magical ability specializing in support magic and a resistance to all magical attacks, but are extremely susceptible to physical damage. 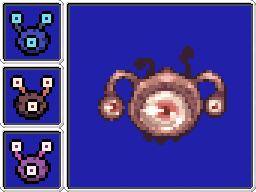 Combine with eyes for high-potency white and black magic or with slimes to minimize physical weaknesses. 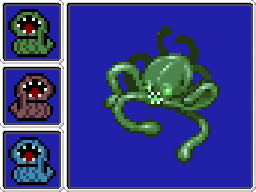 Sea creatures possess the highest strength stat of all types and use multi-hit attacks. If a Sea Creature connects with all of its hits, the damage produced is unparalleled. 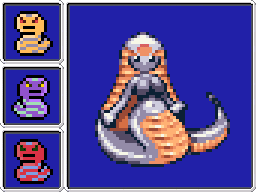 Pair with other strength types such as Snakes or Giants. Demons emphasize attack spells with a touch of crippling status effects for good measure. Cross with equine for some additional speed and durability. Eyes have unparalleled magical strength but are extremely fragile to physical attacks. Cross with equine for a well-rounded spell-sword. 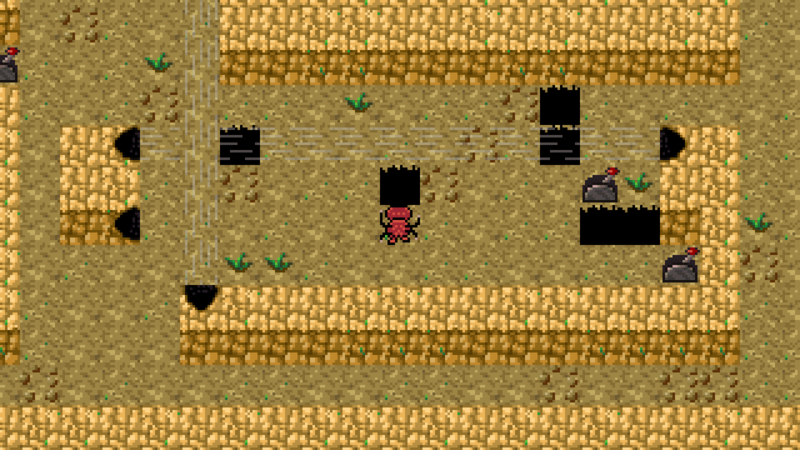 Quick and highly resistant to status effects, spiders go on the offensive with many poison and paralysis attacks. 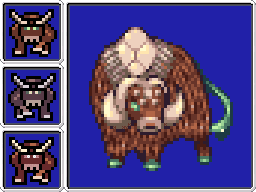 Pair with bulls to avoid getting crushed or stack with felines to maximize initiative and attack damage. 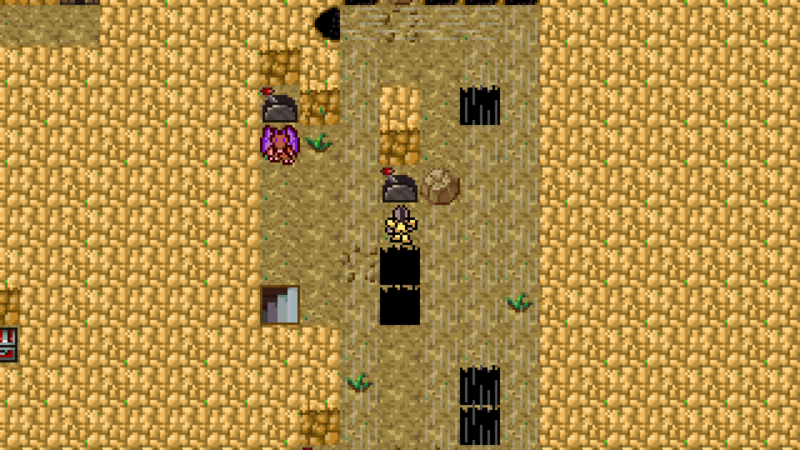 The first objective is to head east to the Cave of Ruby Rock. 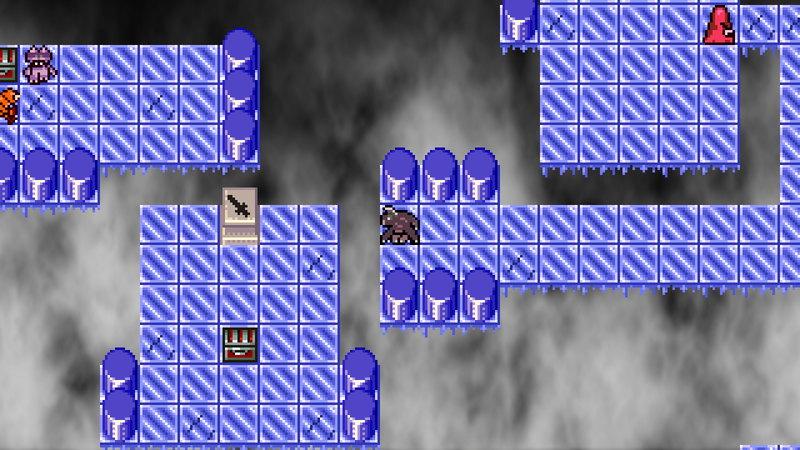 The path east is blocked by doors that can only be activated through switches that in turn can only be activated with the Switchblade. From the central area save point, head north, then west, then south to find the Switchblade. Just north is a Mold enemy blocking a seemingly empty corridor. Walking to the end of this corridor reveals a hidden wall and a Topaz Ring. Heading southeast, find the Speed Boots in a room blocked by a Cerberus. Head northeast for a Battle Point Potion and the passage to the Breezy Corridor. In the Breezy Corridor, head directly north and defeat the group of Ogres. 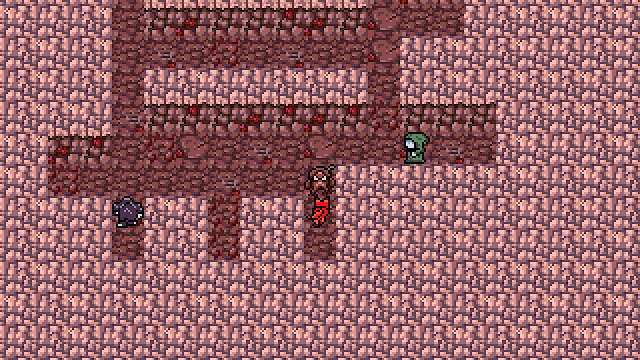 Another hidden wall reveals a Brooch of Protection from Weakness that will prove invaluable against the first boss. 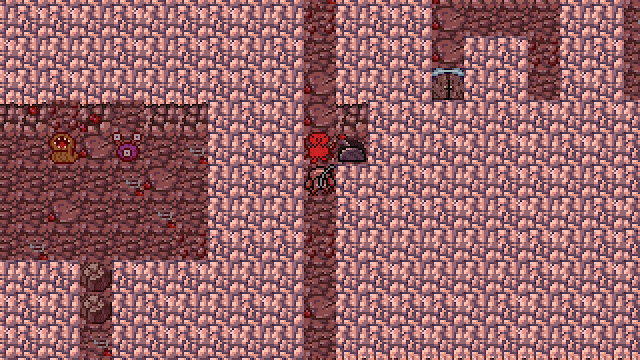 Head southeast where you'll meet Van who states he lost his friends and Master Key in a rockslide one level down in the Cave of Ruby Rock. Continue east to the save point then south until the wind knocks the characters into a pit, down to the Cave of Ruby Rock. Head south, defeat the group of Cerberus, then continue past to the southwest then north as the path wraps around. Defeat the Huntsman then activate the switch to open the nearby door. Head north then wrap around clockwise to get to the open door. 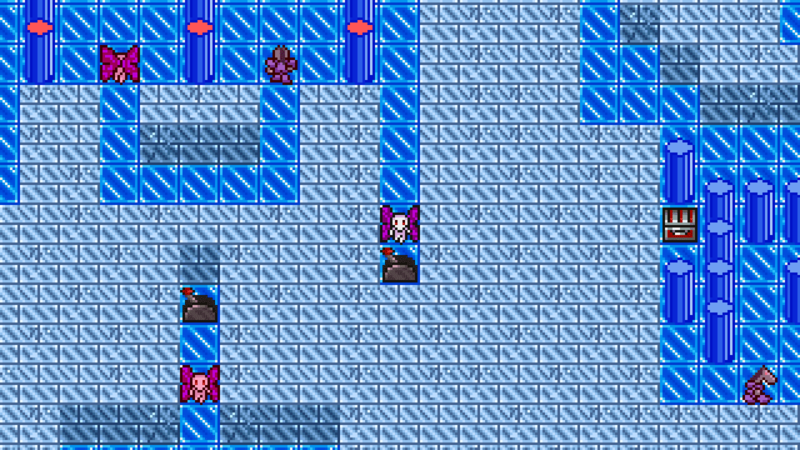 Defeat the group of Sylph then head upstairs. Head clockwise around the room then activate the two switches on the left wall. Head back around the room and pick up the Sapphire Ring in a chest next to a group of Cerberus. Activate the southeast switch, then the northeast switch, then fall into the hole in the middle of the room to find the Mattock. 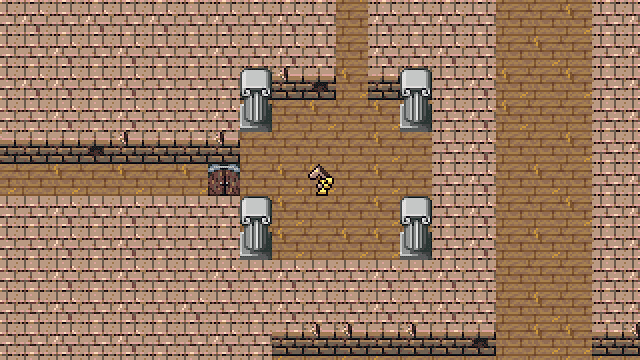 Head north where you can find the Jerkin of Protection in a room sealed by a nearby switch, and a Defense Potion behind a group of Watchers and a hidden wall. Head upstairs. 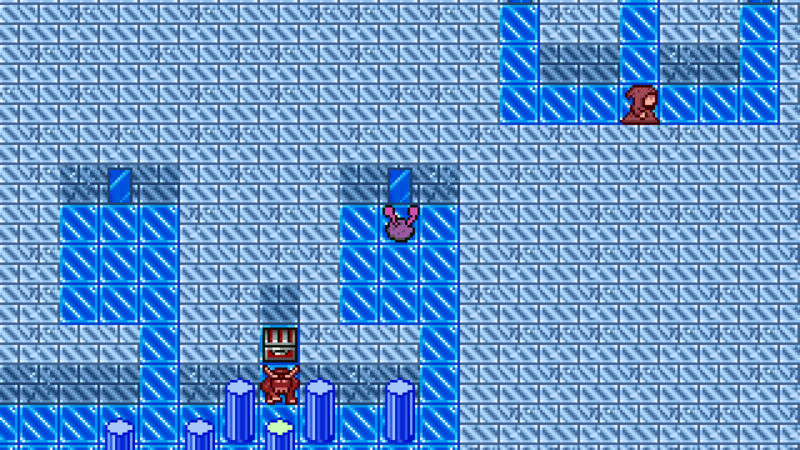 Aim east, break the block, and activate the switch to obtain the Iron Ring. Break the block behind the Python and let the wind carry the characters to the south. Head east. To solve this wind puzzle, step into the first wind current that will take you north to the breakable block. Don't break the block! Step west and activate the switch directly north to change the leftmost current's direction. Step west again and the wind will now blow your characters to the south. Activate this next switch. Step east so that the wind will take the characters back up to the breakable block, then step east again so that the characters fall into the northeastern pit. 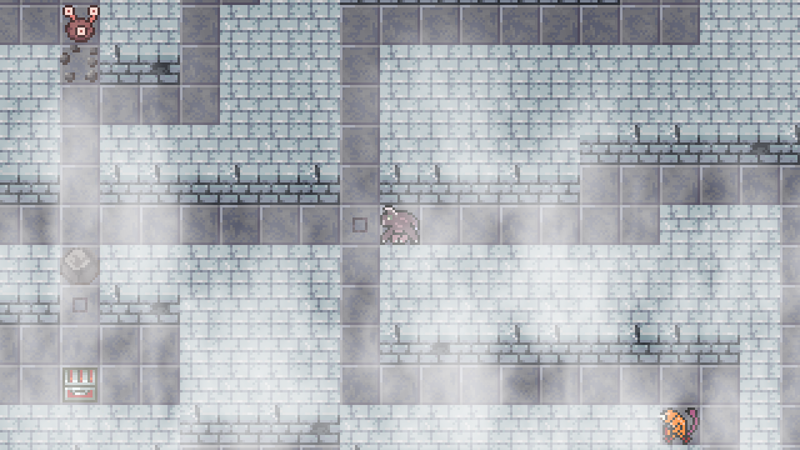 Climb up the stairs, defeat the Mist Dragon and activate the switch behind it. Break the block, head northwest, then go downstairs. Work your way east and be sure to save your game. Storm and Chance will direct you west to the Silent Lake and will hand over the Master Key. Upon leaving you are confronted with the Arch Dragon, the first boss. 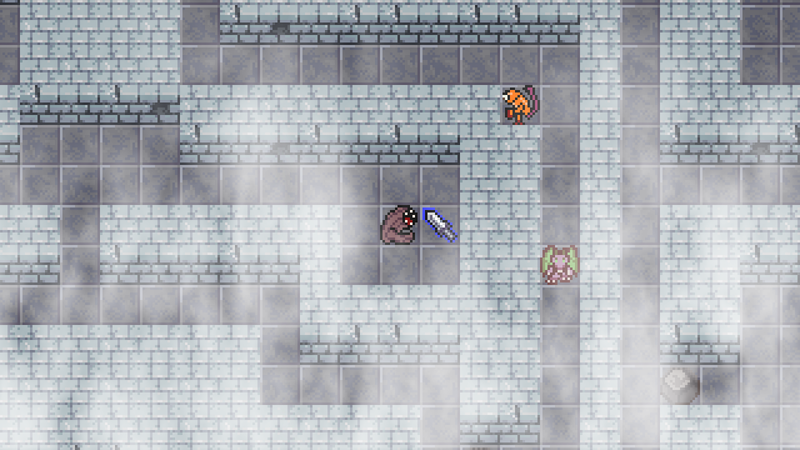 The Arch Dragon attacks with slash and ice attacks and has a high chance of causing weakness. Like most dragons, the Arch Dragon is susceptible to pierce attacks. Equip your party with the Sapphire Ring and the Brooch of Weakness to protect against ice and weakness attacks. 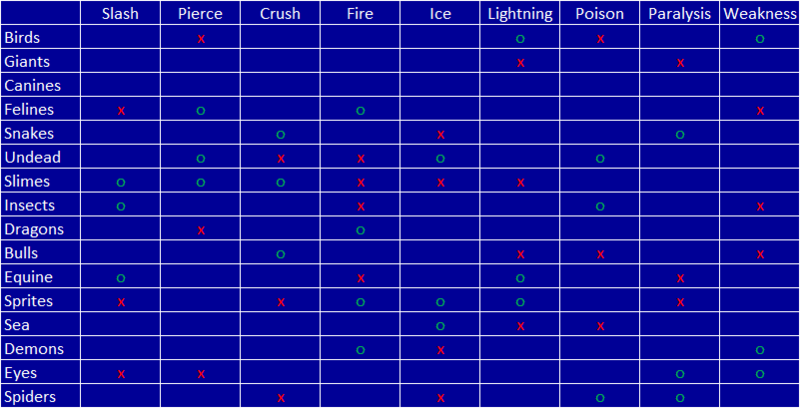 Transform into creatures with these natural defenses and with strong pierce attacks if you have are having any trouble. With the Master Key you can unlock the door to the southeast in the Cave of Ruby Rock. Within, hidden behind a false wall next to a boulder, is a Hit Point Potion. After this, head back west to the Crossroads. 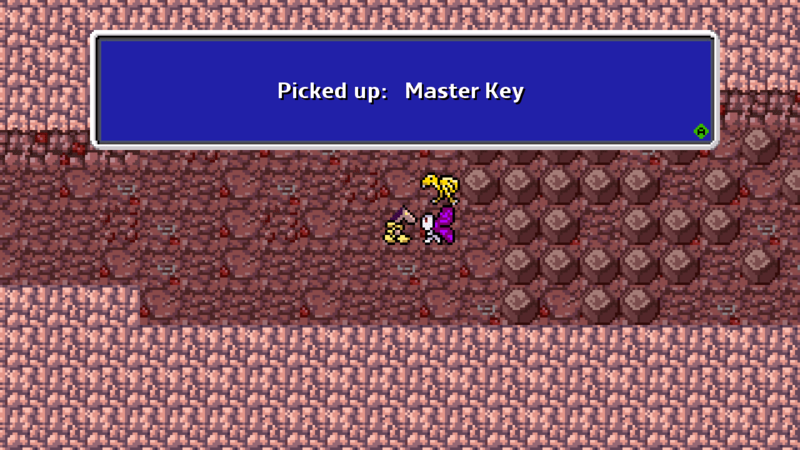 With the Master Key and Mattock, you can now obtain a Strength Potion (east of save point), Steel Ring (northwest corner), and Cursed Necklace (northwest of save point) from this area. Head west to the Silent Lake. 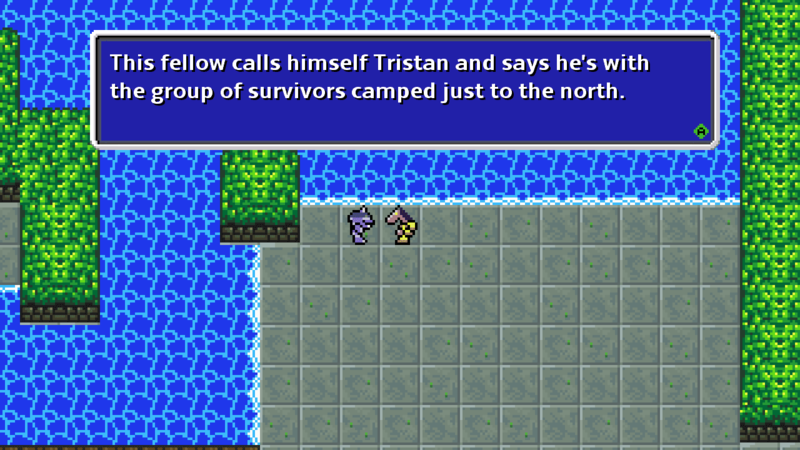 After entering the Silent Lake the group meets Tristan. To get to his camp he suggests traveling through the Aqueducts below. Travel south, open the locked door and head downstairs into the Aqueducts. Head south, defeat the Moondog, then activate the western and southern switches. 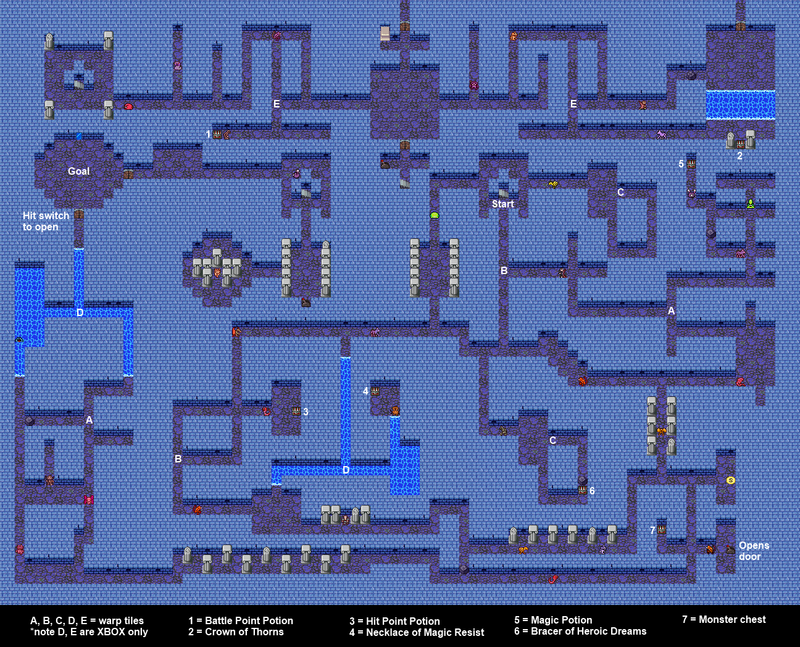 Head back north and take the path to the right to collect the Rock Ring then return south and activate the switch on the right wall. Continue south then west activating switches when necessary. Head back upstairs. Go west then south and activate the switch guarded by the Revenants. Head back to the save point and continue east, taking the northern path. Defeat the Puddings and activate this switch to unlock the door directly south. Backtrack a bit and take the southern path to the now open door. Activate this switch. Return to the save point and go through the two open doors to the north. Take an immediate right turn and activate this final switch to unlock the last door to the north. Continue north through the maze of pillars and go downstairs. Back in the Aqueducts, activate the switches in a clockwise order taking care to not to activate the initial switch from the south. When you have activated the southwestern most switch, return to the start point traveling counterclockwise around the entire room. Head west then south and pick up the Water Moccasins. 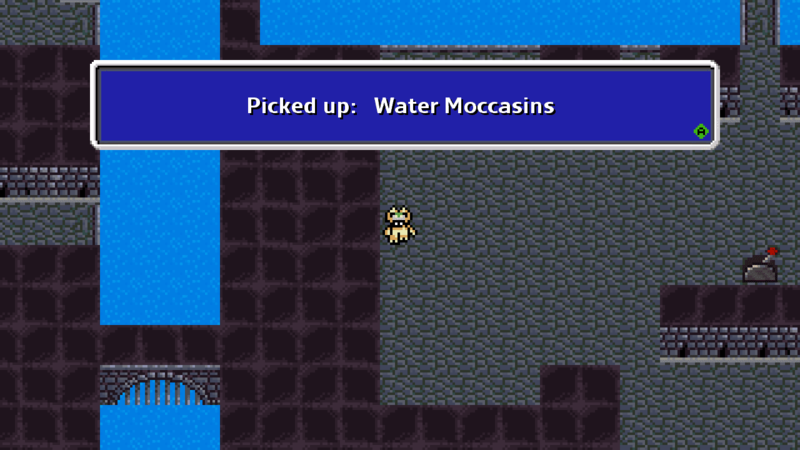 Now the characters can swim in water. Travel north through the water to find a Potion of Strength. Go back upstairs. 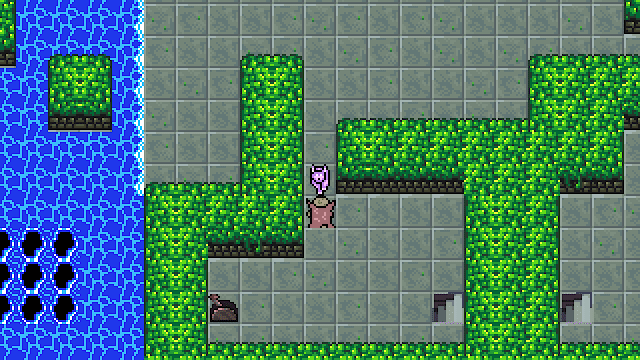 From the save point, go south to enter the Mirror Maze where you can find an Agility Potion and the Brooch of Protection from Paralysis that will come in handy with the upcoming boss. 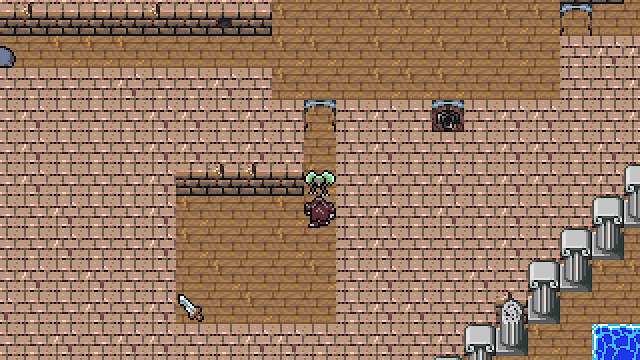 The Agility Potion is hidden behind a false wall as you travel east. Downstairs in the catacombs you can find a Battle Point Potion and the Crown of Thorns, but it is very difficult to navigate in the darkness. It is easier to traverse this area later when the party has found the Candle. Now that the party can swim, a number of items can be collected. Falling into the whirlpools west of the save point reveals the Brooch of Protection from Poison. 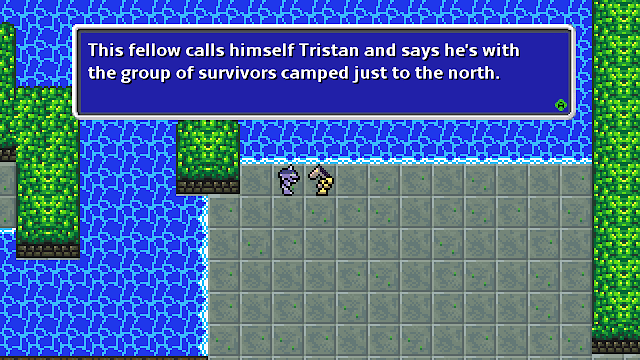 To the east on an island by the entrance to the Crossroads is a Battle Point Potion. North of the pillar maze are two whirlpools. Fall into the northern whirlpool to find the Crown of Vitality. To the northeast of the Silent Lake is a room with multiple whirlpools. Fall into the southernmost whirlpool to find the Boots of the Berserker. 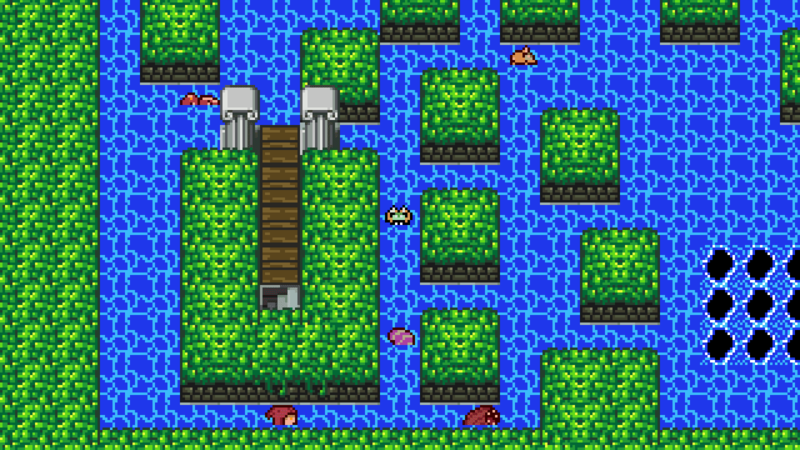 To continue onwards, head to the southwest corner of the Silent Lake, navigating through the small islands, and go down the stairs. This next room has three switches. Activate the westernmost switch so that the current takes the party to the other side of the gate. The next puzzle involves four switches that must be activated in the following order to proceed. From left to right, activate switches 1, 2, 4, 3, then 2. 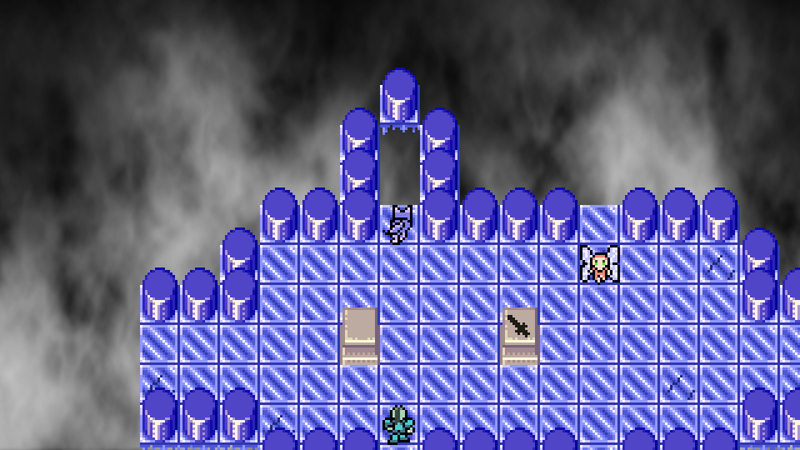 Before going upstairs, defeat the Arion and continue west beyond the false wall to find a Magic Potion. Upstairs is Legna's camp. 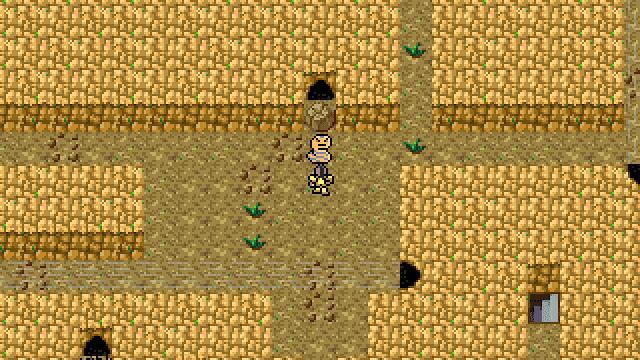 When the other party members are sleeping, go west and investigate the mirror to discover a bit of the main character's past. 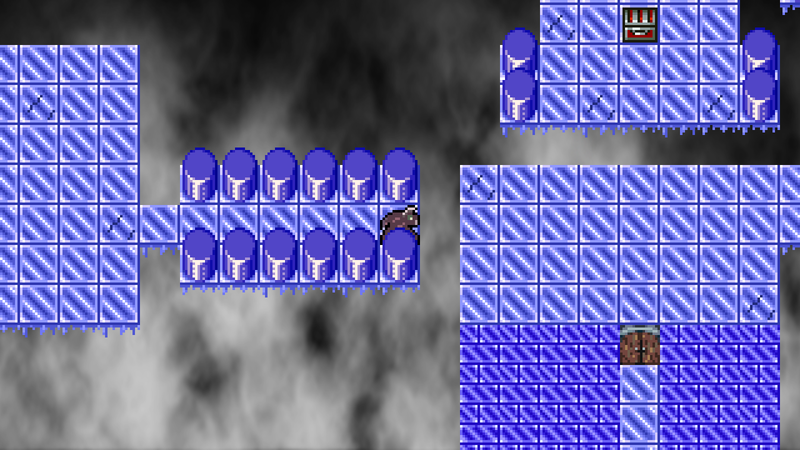 When the others wake, continue down the eastern set of stairs and save the game. The next boss is the White Tiger. 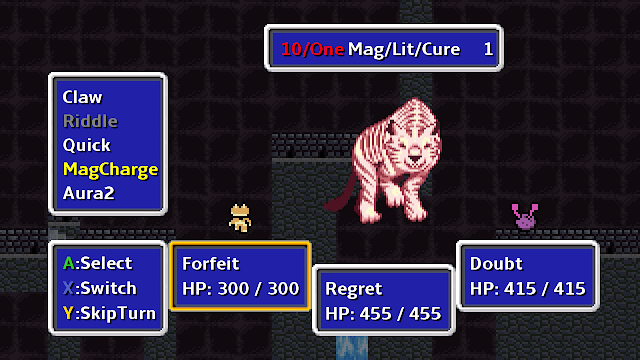 The White Tiger hits hard with strong physical attacks that can cause paralysis, and is weak to poison and weakness status effects. 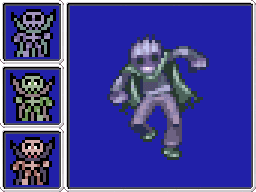 To succeed, equip the Brooch of Paralysis, and come prepared with attacks that cause status effects and character types that are strong to physical attacks. Go north to enter the Demon Nest. Continue north taking any of the branching paths and defeat the group of Corruption Dragons seemingly blocking a dead end. 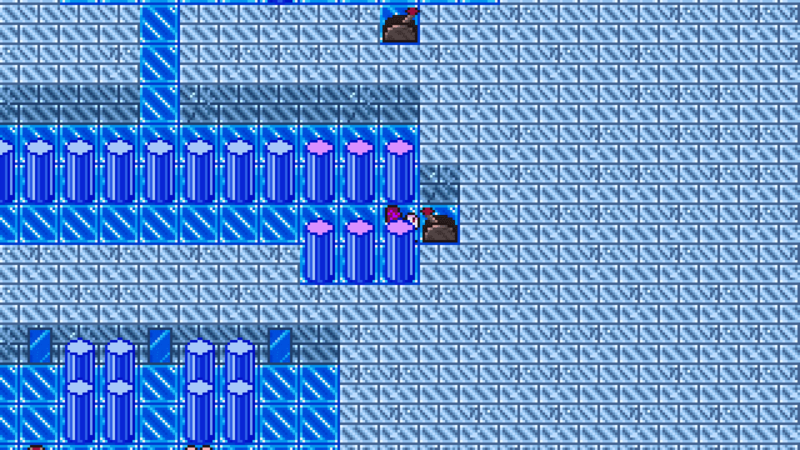 The right wall is false and conceals the Stone Dagger used to activate warp pedestals. 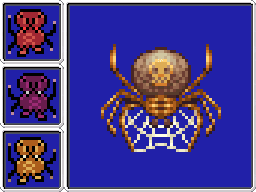 To the south you’ll find a warp pedestal guarded by a group of Dream Spiders. Activate the pedestal to warp to the Chasm above. Make your way around the platforms and fall into the gap at the end of the narrow bridge lined with pillars. 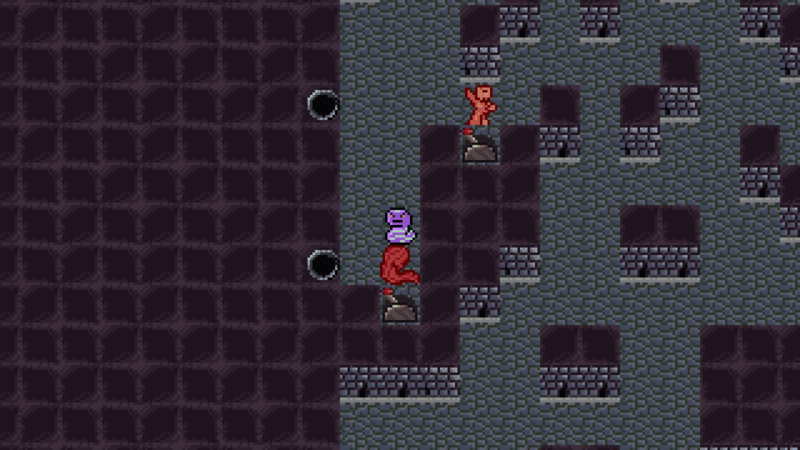 Back in the Demon Nest, there is a false wall behind a group of Naga concealing a Ruby Ring. Continue east and activate the warp pedestal to warp back up to the Chasm. Go west then take the southern path and fall off of the end of the walkway to end up in a room with two warp pedestals. 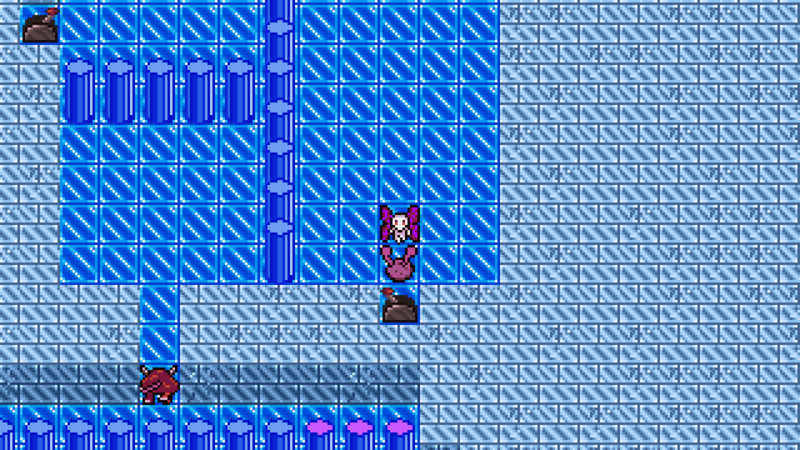 Use the western pedestal and pick up the Magical Shoe from the chest. Warp or fall back down to the Demon Nest and step on the pressure plate just to the northeast of the now locked warp pedestal room. Head west then slightly north to find a Potion of Defense. Go back south and transfer over to the westernmost of the two north-south paths at the first opportunity. Continue southwest to find a small room guarded by a group of Medusa. Activate the warp pillar within. You’ll find yourself on a platform with four pits. Fall into the southwest pit and pick up the Power Glove from the chest. Go east and step on the pressure plate on the ground. Defeat the enemy to the west and continue traveling west. Take the southern path at the dead end to find a Magic Potion from a chest. Continue southwest and defeat the group of Dream Spiders blocking a room with a warp pedestal. Back in the Chasm, defeat the enemy group to the northwest and fall into the hole. 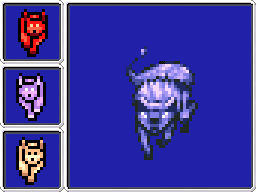 Note that the Fenrir’s Blessing2 ability is very useful for the upcoming boss battle. Grab the Strength Potion and travel south to find a group of Corruption Dragons blocking a small room with a warp pedestal. Activate the pedestal to find yourself on a narrow path. Fall off anywhere, take a short trip north and activate the warp pedestal. Make sure to save the game. The Arch Tortoise has high physical resistance and is only weak to ice attacks. 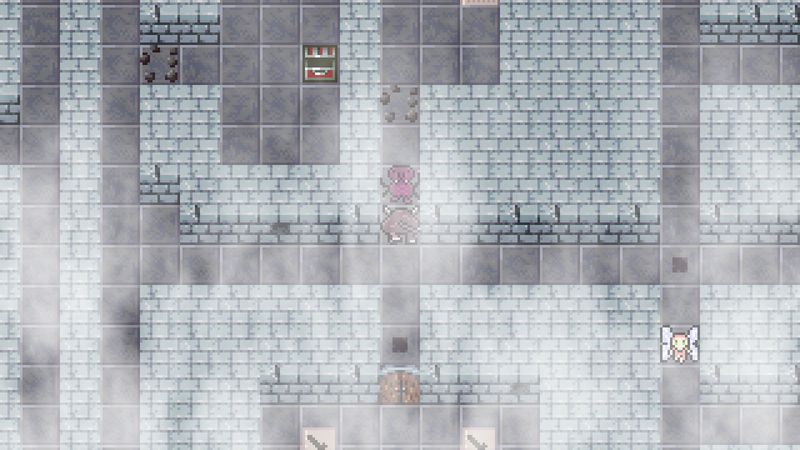 The Tortoise uses high-damage physical attacks and non-elemental magic. The boss fight is a battle of attrition. To offset the high rate of damage received, use Regen or Blessing abilities. 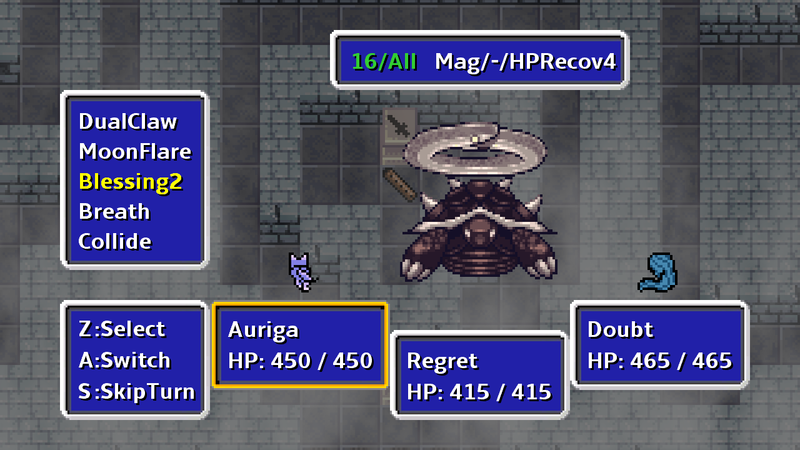 When the Tortoise uses its Shell counter move, take the opportunity to cure or re-buff the party. 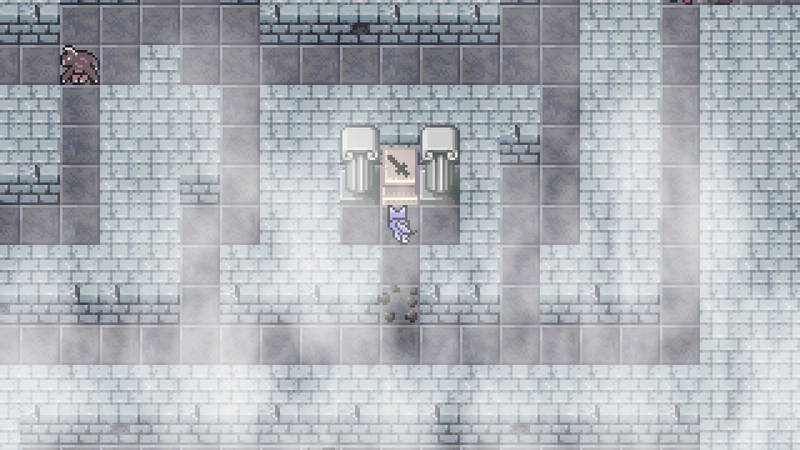 When the Tortoise is defeated, pick up the Flute and activate the warp pedestal to warp back to the crossroads. 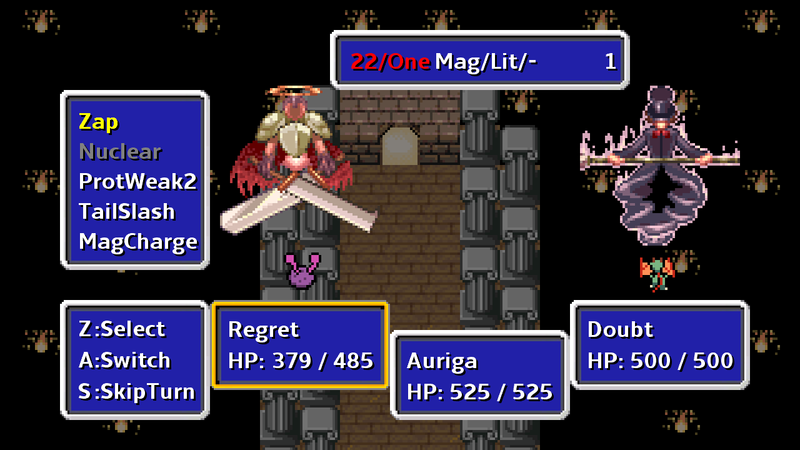 Assist Legna’s group that is now under attack and awaken the stone warrior. 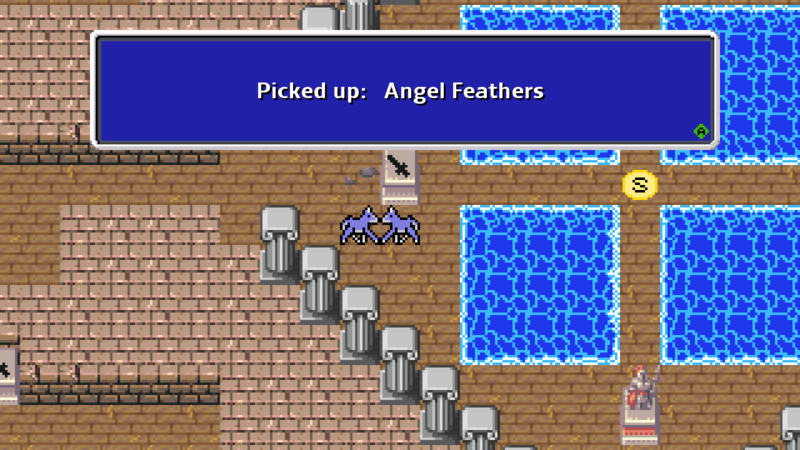 When you regain control, warp back to the Crossroads and speak with Van to acquire the Angel Feathers. The Feathers allow the party to jump across one tile wide gaps. 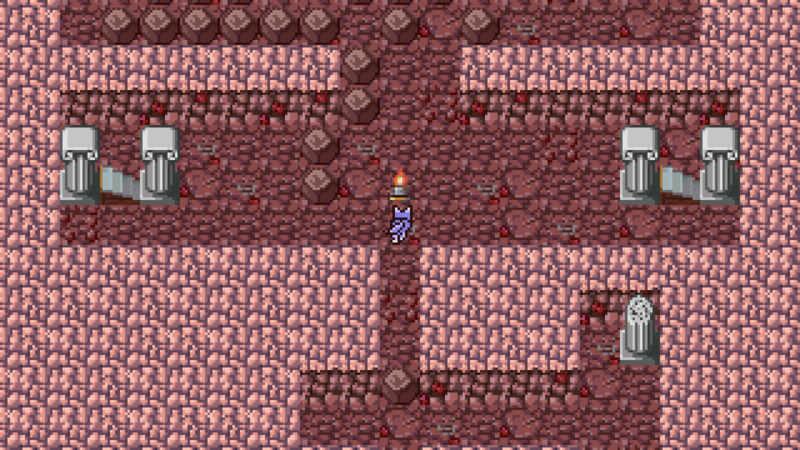 Warp back to the Cave of Ruby Rock (the right pedestal in the Crossroads), head northeast and go upstairs. Head south to the room of pits, activate the western switch, enter the now open door to the east and activate the switch within to turn off the wind to the south. Continue east. Follow the diagram to solve the next puzzle, and then go south. 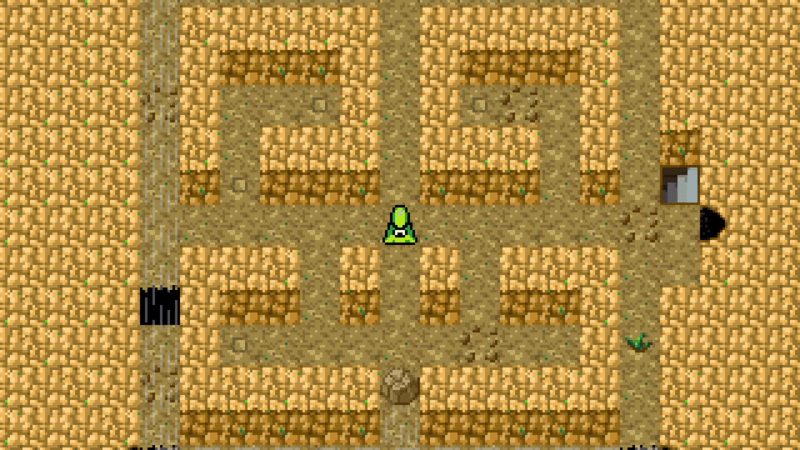 At this intersection, continue south beyond the false wall and go downstairs to find a Hit Point Potion. Go back upstairs, take either the west or east path, and find the Candle down the stairs. The Candle makes it easier to navigate in the Catacombs. 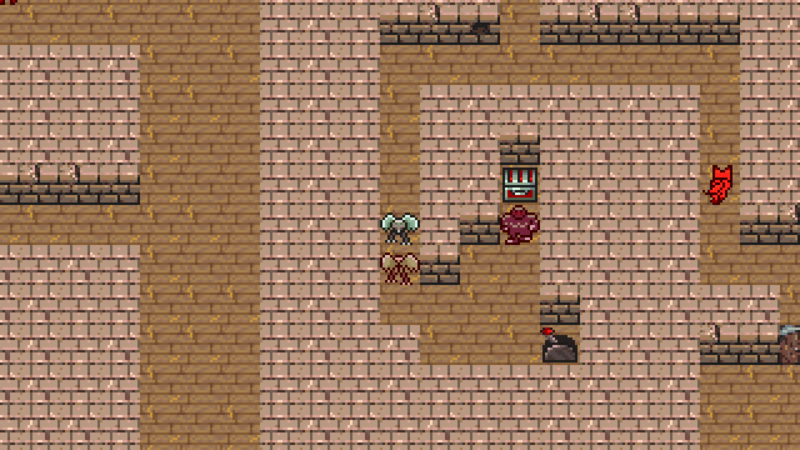 Before continuing to the catacombs, a number of items can be acquired. Just south of the Breezy Corridor save point and through some water, the Bracer of Recovery can be found. Within Van’s new camp is the Book of the Learned. It can be acquired by going upstairs, pressing the northeast pressure plate, and then pressing the two northwest pressure plates. Take the central wind stream to the south, break the block, and be swept into the pit where you will find the Book. Take the northern warp in the Crossroads to return to the Chasm. Head east and jump the gap to find the Necklace of Regeneration. Warp back to the Crossroads and head north to re-enter the Chasm via the locked door. Jump the gaps to the north to find a Potion of Defense. At the Silent Lake west of the pillar maze you can find a chest blocked by a whirlpool. Jump the whirlpool to find the Cursed Bracer. 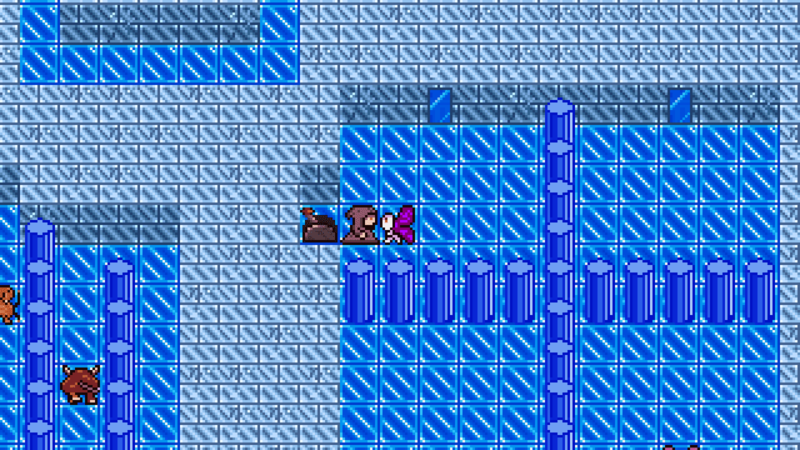 In the water, near the northeast corner, activate the warp pedestal and find a Hit Point Potion. From either the Crossroads or the Silent Lake, head south and enter the Mirror Maze to continue the journey. From the Crossroads, head south and enter the Mirror Maze. Continue south taking the right path and jumping the gap. Head downstairs to enter the Catacombs. 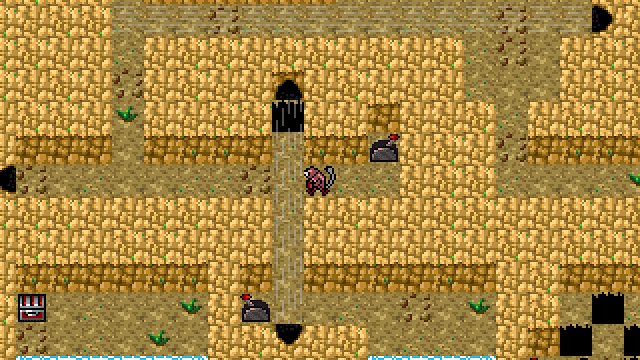 The goal in the catacombs is to first activate the switch at the bottom right corner of the map, then navigate to the room with the mirror near the upper left hand portion of the map. If the party steps on certain tiles (marked with letters on the map), the party will be warped to another location (marked with the same letter elsewhere on the map). **Note - as of v.1.5, the warps have been removed. Check the mirror for a scene, then pickup the Mirror's Eye. The mirrors in the Mirror Maze are now activated. Head east and go upstairs. Back up in the mirror maze, the goal is to remove the pillars blocking the mirror in the central area by activating switches that correspond to the color of the pillars. Travel north, east, then south around the central area and activate the mirror to the north of the eastern staircase to warp to a different location. Defeat the group of Death and activate the switch. Warp back to the central area and activate the mirror directly north of the western staircase. Travel south and take the easternmost path. 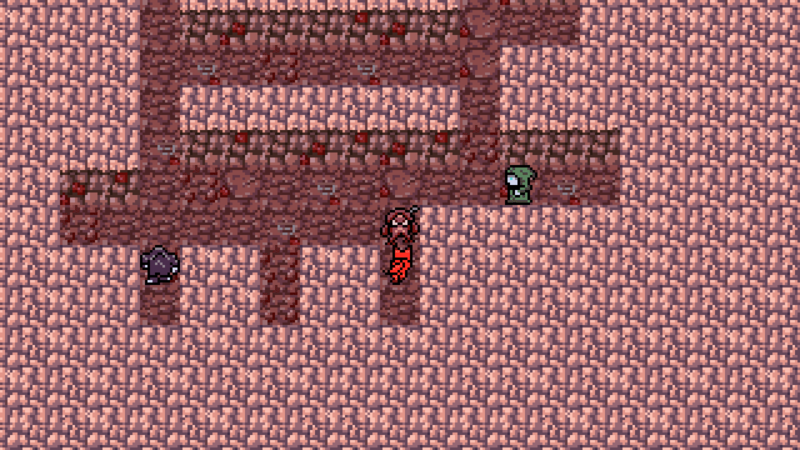 Fight the Blood dragons and activate the switch behind the hidden wall. Head west past the pillars and activate the mirror. 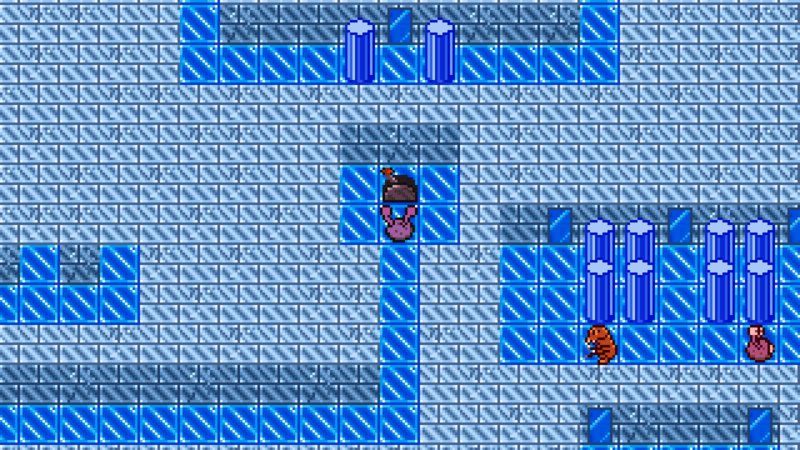 Travel east and activate the switch to remove the first layer of pillars barring the central area mirror. Head back west and activate the western mirror. Defeat the group of Evil eyes and activate the switch. Return back to the central area and return to the mirror directly north of the eastern staircase. 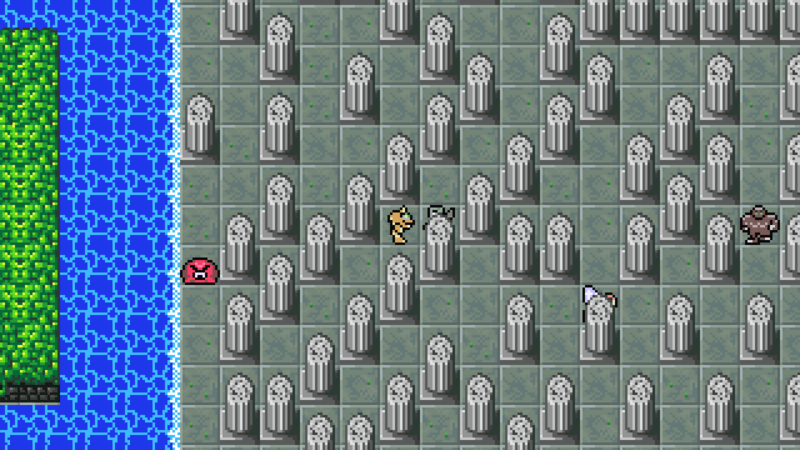 Activate the mirror and travel around the corridor of pillars to activate the switch at the end. Note that there is a hidden wall to the south concealing the Necklace of Physical Resistance. 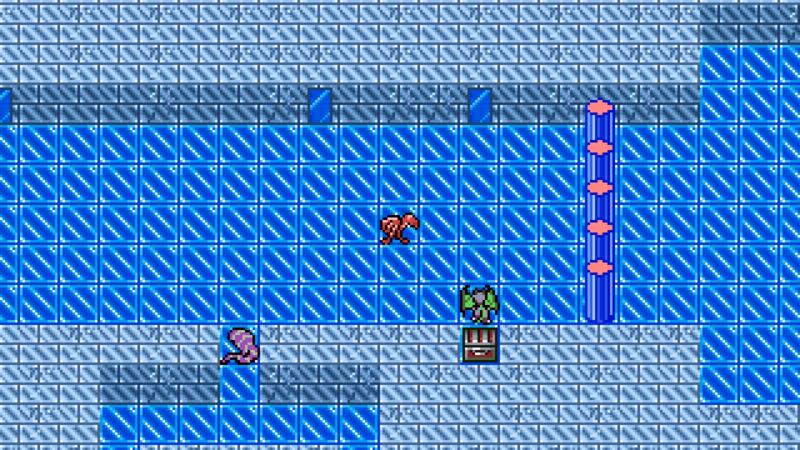 Return to the central area and activate the mirror east of the save point. To remove the pillars blocking some optional treasure, activate the mirror to the east, travel south to flick a switch, then warp back through the same mirror. Travel west and defeat the group of Pazuzu and activate the switch. 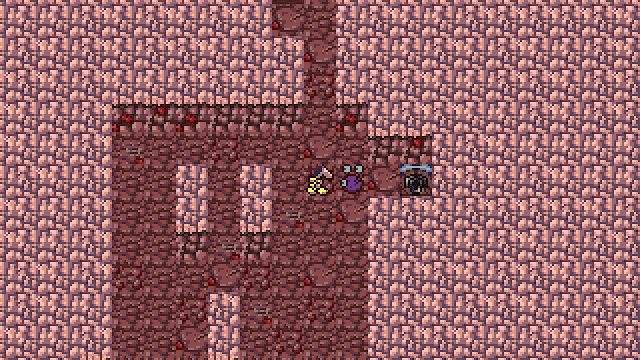 Go east then north to a maze of pillars to find a Strength Potion and an Agility Potion. 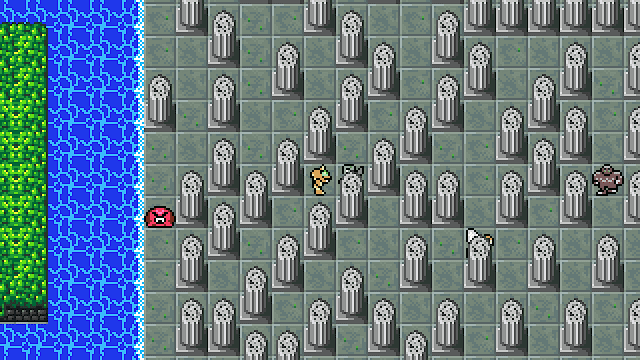 Travel north through the maze of pillars and activate the mirror. 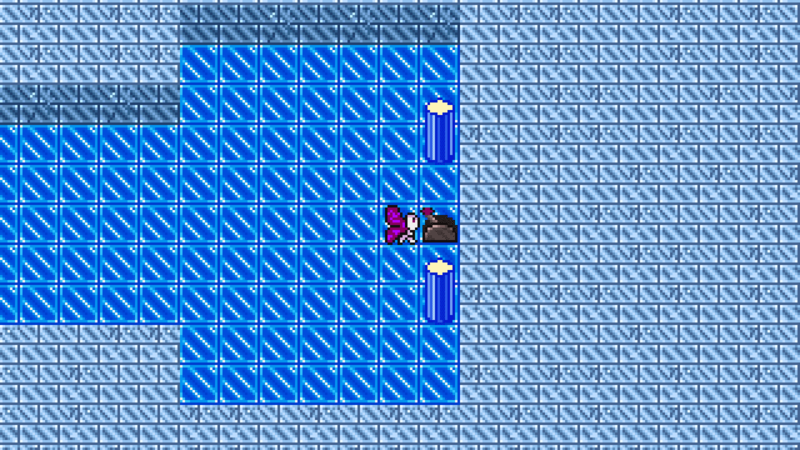 In this next room activate the middle mirror, then the mirror to the upper left in the next two rooms. Activate the switch to the south then retrace your steps back to the pillar maze. Head south and use the easternmost mirror. Travel south and activate the mirror. Go north and defeat the Blood dragons to find a Battle Point Potion behind a hidden wall. 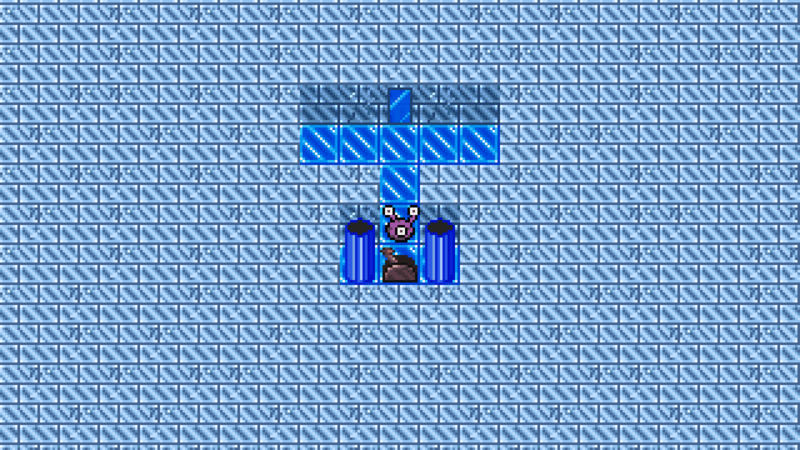 Travel east and activate the switch to remove the second and final group of pillars blocking the central mirror. 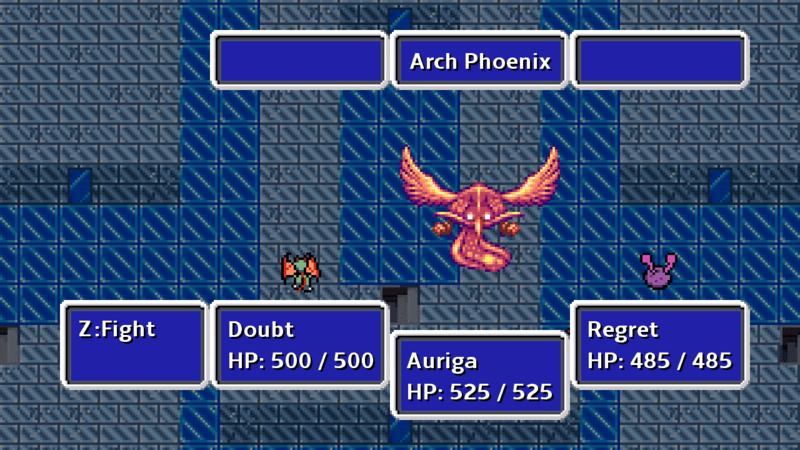 Travel back to the central area, save the game and use the center mirror to face off against the Arch Phoenix. 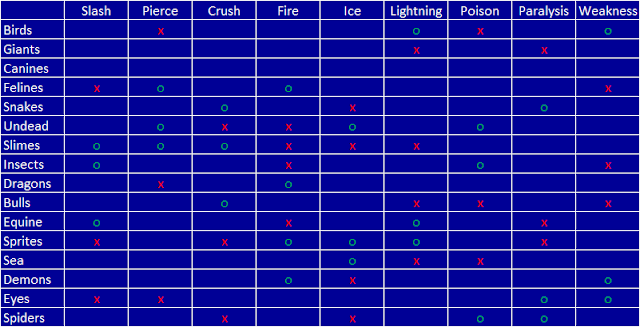 The Phoenix is very quick and attacks with pierce, crush, and fire moves. Like all birds, the Phoenix is weak to pierce attacks. Elevate the party's agility with accessories and try to slow the Phoenix down with attacks that inflict weakness. Afterwards, head downstairs, flick the switch and head north into the Crossroads Basement. For the final encounter, you can choose to defeat your comrades for one ending or skip battle turns to initiate the true final battle against two opponents--the Traveler and the Reflection. The Traveler is weak to crush attacks and strong against all elements. The Reflection is strong against all physical attacks but is weak to poison. To succeed, focus attacks on one enemy until defeated, then switch to the other. 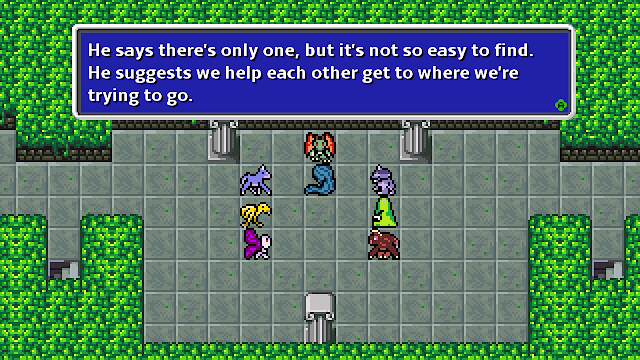 If the party is stronger against physical attacks, focus on the Traveler first; If stronger against magical attacks and status effects, focus on the Reflection.